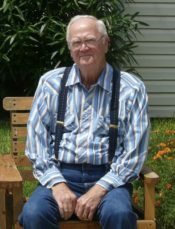 Doyle E. Carlton Ward passed away November 28, 2018 at the age of 89. Doyle was born August 27, 1929 in the Glendale Community of rural Walton County, FL. Doyle was the youngest of a family of nine brothers and one sister. In 1932 his family moved and settled in the Allentown Community of Santa Rosa County. Doyle worked on the family farm until 1951 when he joined the Army and served two years, being discharged at the end of the Korean War. Doyle is proceeded in death by all ten siblings; his parents, M. E. and Gussie Ward; and his wife of 53 years, Juanita. He is survived by a daughter, Pamela K. Clark of Hamshire, TX. ; a son, Danny Helms of Milton, FL; and several grandchildren. After serving in the Army, Doyle returned home and started work for the recently completed Chemstrand Corporation Nylon Processing Plant near Cantonment. While working at the plant, Doyle met his future wife Juanita, who was one of the original “ladies in blue” and they married in 1958. After retirement from Chemstrand, Doyle owned several small business ventures, including a wood working facility that produced products sold by Walmart across the country. Doyle was a 32rd degree Mason and a member of the Hadji Shrine Temple of Pensacola, FL. Doyle was also one of the founding members of the Temple’s Antique Car Corral. Early into his retirement, Doyle volunteered as an assistance and logged thousands of miles with the transportation of children to several of the Shrines Hospitals throughout the United States. The Ward family would like to thank Katrina Nowles and Mary Muller for their assistance during the family’s time of need. Visitation will be held at Pensacola Memorial Gardens and Funeral Home on Pine Forest Road on Tuesday, December 4, 2018 from 1:00 pm to 2:00 pm, with the funeral services to follow at 2:00 pm. Graveside services to follow immediately after. In lieu of flowers, please donate to the Shriners Hospital for Children. Uncle Doyle, you were always a very special person in my life. We always looked forward to your visits . I’ll always remember the things you taught me, the advice you gave me, the family stories you told me and what a wise, loving, generous man you were ! You gave us a good example of how to live to make this world a better place. You will live in my memory forever- Until we meet again Uncle Doyle !